See working papers in Canneto Think Tank. New or modified text is in bold. The mud volcanoes at Agrigento, Sicily are shown as a brown dot. See Sicily's other volcanoes. 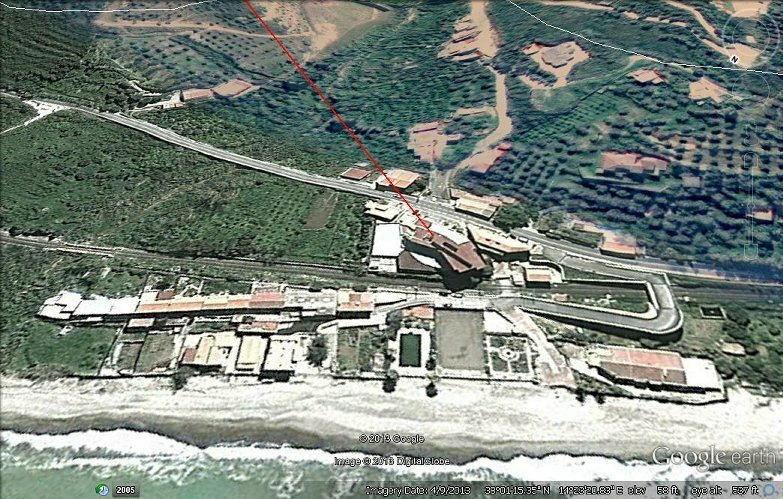 Here is a Google Earth bird's-eye-view image of Canneto di Caronia. The idea is that electrical discharges (usually associated with human presence) ignites the methane which then triggers other combustibles, including volcanic ash, into fiery displays. If this scenario comes to be validated then the residents of Canneto should consider the possibility of a volcano appearing in their town. Even if the fires at Canneto di Caronia turn out to not be related to volcanic activity, the evidence that Mt. 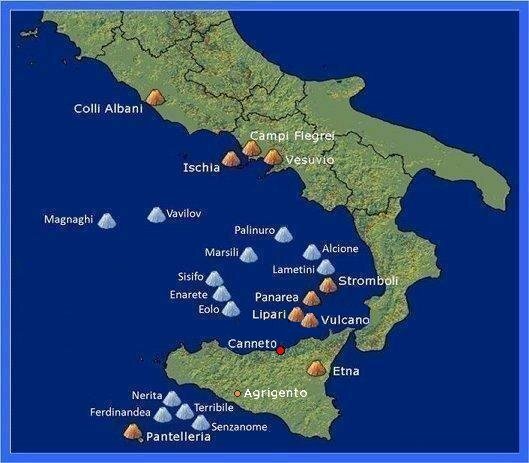 Etna is plugged up (with maga spreading out horzontally underground), coupled with the decreasing numbers of Etna area earthquakes, suggests that a Mt. St. Helens type of catastrophic erruption may be in the making. Such an erruption, if it comes, would likely take place a month or so after the start of a rainy season. (Melted snow could also be a source of water for steam generation.) [Added 08 Jan 2005.] See Part 3 for more info. See the 16 April 2004 entry on the Canneto Think Tank, Part 2 page. The next two graphics are also from INGV Sezione di Catania. They are Milo webcam views, looking west-northwest up through the Valle del Bove. They show the 7 September and 13 September fissures. See INGV Milo view of the new fissures in Bove Valley on 13 September 2004. 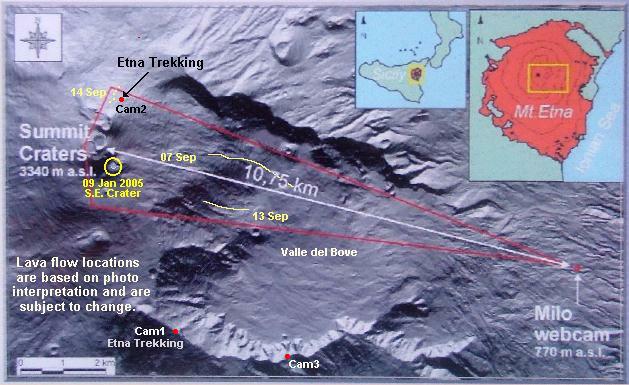 See INGV Milo view of the fissure activity in Bove Valley on the night of 13 September 2004. See Etna Trekking Cam2 overlapping views across Bove Valley. Whether there is a connection between the unusual 15 July rainstorm and the new fissure activity is yet to be determined. (Ground-water which reaches the appropriate magma reservoirs, in sufficient quantity, can produce steam-driven bulging and fissure activity (or worse things). The bowl-like nature of the Valle del Bove might serve to concentrate rainwater in a crater-lake fashion before it descended toward Etna's plumbing system. Was there a short-lived lake in the bottom of the valley? Visit the following Mt. 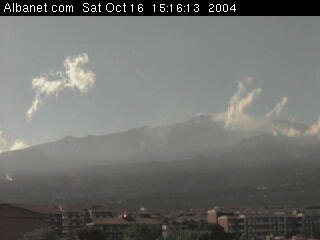 Etna Webcam sites: AlbaNet.com , Etna Trekking(*), INGV, etna2004 videobank. (*) The Etna Trekking website webcams are set up to install cookies on internet visitor computers. You may need to relax your internet options privacy level to see the images. Section on manually defusing Etna has been removed. The Active Volcanoes / Aktive vulkaner: Etna, Italy site has up-to-date news (with photos and lava flow maps) for the current Etna activity. Assuming that there was a connection between Etna's having been plugged up, and the seemingly spontaneous fires that occurred in Canneto di Caronia, then as long as the lava flows in Etna's Valle del Bove (or other places near the summit) continue to vent volcanic internal pressures, the Village of Canneto di Caronia should have no further problems with fires breaking out. See the following cloud activity animations which are based on still frames made by Albanet's WebCam (2) on Oct. 16, 2004. End of Mt. Etna summary. The think tank was installed on 9 April 2004 and contains excerpts from e-mails from other researchers and parties interested in the Fires of Canneto di Caronia. Entries are presented in chronological order.